Whisk together Walnutmilk, butter and eggs in a medium bowl; stir in cheese, 1/4 cup nuts and bacon bits. Add dry ingredients and stir just until flour is incorporated. Using 1/4 of the batter at a time, cook in a greased waffle iron until waffles are a light golden brown. 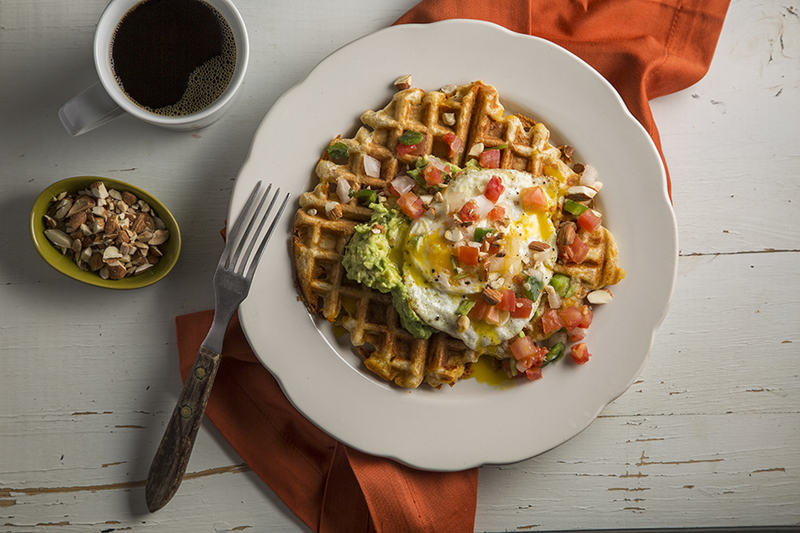 Top waffles with mashed avocado, fried eggs, pico de gallo and remaining nuts. Add a large pinch of additional cheese to the top of the waffle batter before closing the waffle iron for a crispier crust. The best way to re-crisp cooked waffles is to put them back into the hot waffle iron for about 10 seconds.